A couple of weekends ago I headed over to Box Hill in Surrey with MOH. The plan was for him to cycle on some of the roads on the route of the Prudential Ride100, so off we went with his bike strapped to the back of the car. We parked in the National Trust car park near the Visitor Centre, him readying himself for the ride and me looking for the start of the Stepping Stones walk. I'd chosen this walk over cycling up Box Hill because I remembered just how steep Box Hill was from my childhood visits. And because I'm still not that big on going up hills on my bike! The walk starts just outside the visitor centre and is clearly signposted throughout and you're quickly at the Salomons Memorial viewpoint and these fantastic views. 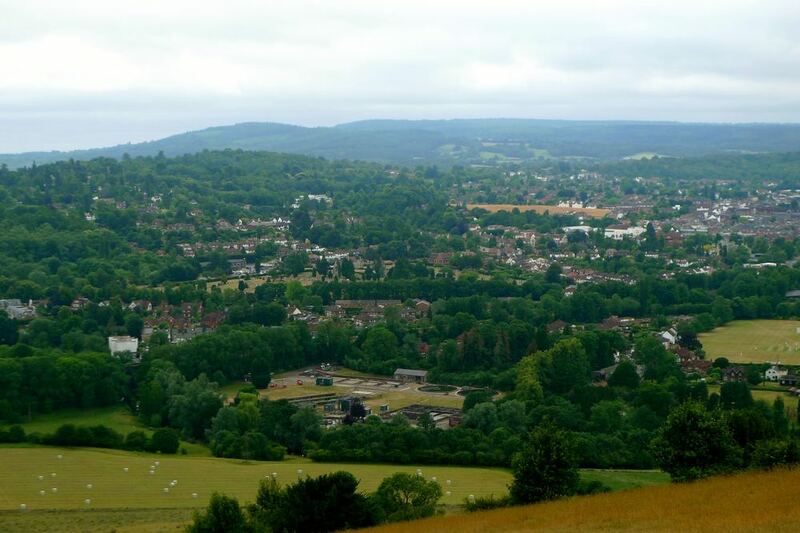 The viewpoint was built to commemorate Leopold Salomons who gave the original 230 acres of Box Hill to the National Trust in 1914 and it overlooks Box Hill's famous panoramic view to the south of over twenty five miles. Then it was time to start my descent taking the 275 steps down through the Yew wood. 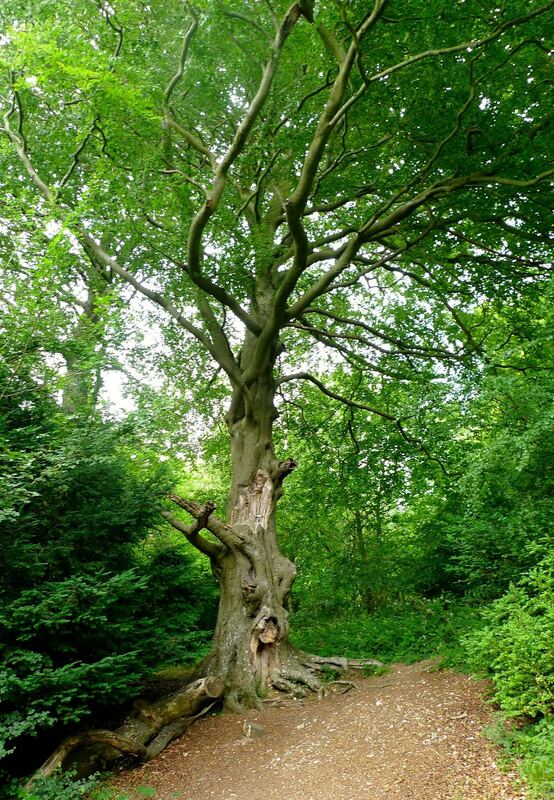 Some of the trees on Box Hill are more than a thousand years old. There were plenty of gnarled branches and twisted trunks, dens and trees seemingly pointing the way. Shortly after the steps I reached a fork in the path; the left took me towards the stepping stones and the right-hand path leads to the footbridge over the River Mole. As this was named the Stepping Stones walk I headed towards those. I warily crossed the river using the stepping stones, after a false start when a group of people appeared behind me. Knowing that I might take a while to cross - as sometimes my legs don't work when they need to swing over water - I stepped back and let them go ahead. I made it across without dipping my toes into the river and admired the reflections of the trees on the water. I followed the path along the river, my legs pleased that we were back on flat ground and soon I entered the Burford Meadow with its complete change of scenery. At the end of the meadow the walk passes for a short while along the path of the A24 until the Burford Bridge Hotel where I took a small path just past the hotel with this view. Yeap, the only way was up! The walk avoids the steps on the way up and I'll admit at times the walk up was tough going. But I took plenty of opportunities to stop and admire the views around me, including up to where I was heading and back from where I'd started. 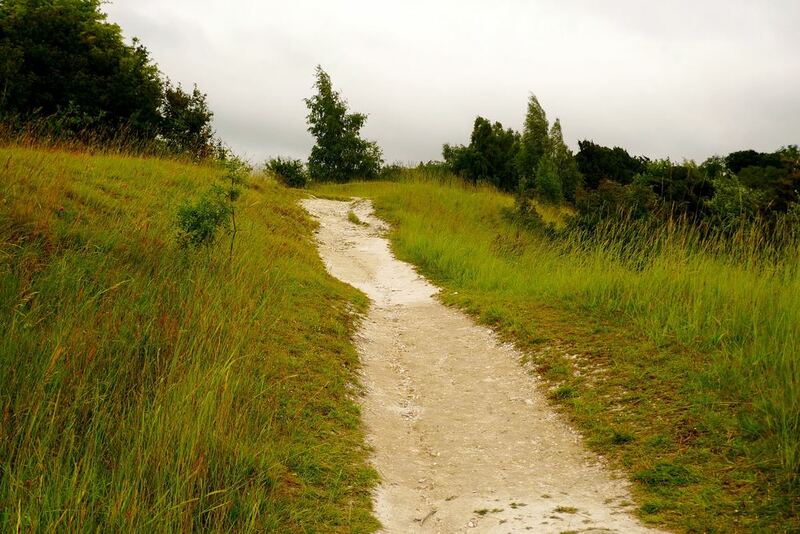 At the ridge I joined the white chalk path, which continued uphill albeit at a much gentler incline. The walk ends with a visit to the Old Fort before heading back to the Visitor Centre. I'll share my pictures and some history of the Old Fort in another post soon. This was a great walk which reintroduced me to the beauty and hills of Box Hill. At two miles it was easily do-able in the hour and a half that the walk leaflet suggested. And I think the walk up Box Hill was harder work than cycling as when I met up with MOH he deemed cycling up the Zig Zag Road "not too bad!"